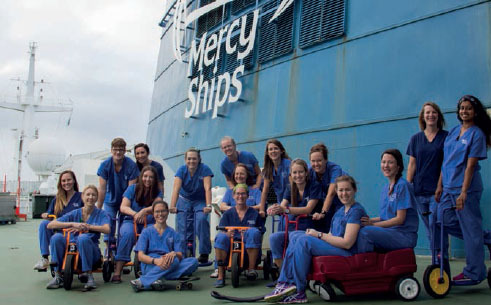 Nurses from all over the world serve on Mercy Ships, so why not join them on their next mission? Docked in Toamasina, on the east coast of Madagascar, the world’s largest floating hospital ship is home to hundreds of nurses delivering health care to the world’s fourth-largest island nation. For nurses who don’t want to play it safe, Mercy Ships is a challenging, yet attractive proposition. The charity has provided medical support and surgery to 2.9 million people over 37 years. Funded by charitable trusts, churches and schools, the faith-based organisation has operated in 53 developing nations where medical care is limited, including Guinea, Republic of Congo and Sierra Leone. The ships go where they’re needed, creating a legacy by training locals. Children’s nurse Ella Glass gave up her job at Great Ormond Street Hospital for Children to join the 450-strong volunteer team. She spent four and a half months on an island where 90% of the population live on less than 75p per day, and free health care is non-existent. Ms Glass will soon take up a post as healthcare manager in South Sudan for an international aid organisation. Apply three to six months in advance. Stints range from two weeks to five years. Applicants pay crew fees, insurance, transport and personal expenses. Volunteers must have 75% funding a month before they start. Families welcome; 50 children live on board. Mercy Ships have visited 451 ports in developing nations. For many volunteers, returning to the UK is a culture shock. Ms Gaul says it took her three months to readjust to the pace of an NHS ward. Now, she is struck by the good fortune of NHS staff and patients to be in a country where health care can be accessed by all. ‘It was frustrating seeing patients with tumours that could br easily treatable in the west, but are unable to pay for surgery,’ she says. ‘It is sobering to be reminded how privileged we are’.